Let me be clear about one thing, a true experience is not an enhancement of services to support an offering, rather, the experience is the offering which is supported by goods and services. If the experience is the offering, than what type of customer experience are you staging? Pine and Gilmore identified two dimensions of an experience. The first dimension is that of customer or guest participation. At one of the spectrum lies passive participation and at the other, active participation. The second dimension of an experience is the type of connection or environmental relationship that connects the customer to the event or performance. At one end of this spectrum lies absorption, viewing from a distance. At the other lies immersion, becoming physically part of the experience itself. Combining these two aspects helps to define the four primary types of experiences customers can partake of. In the upper left lies the passive absorption of Entertainment such as listening to music, watching a performance or even reading for pleasure. In the upper right lies the active absorption of Educational Experiences. To the lower right lies the active immersion of Escapist Experiences where customers are actively involved. In the final quadrant to the lower left lies the experience of the Esthetic such as viewing artwork in a gallery or museum. Combinations of any two of these experience realms can create six additional blended experiences. The real differentiator for a great customer experience is the ability of hitting the sweet spot between all four realms into one blended experience like Walt Disney has achieved with the theme parks. So, the next time you hear someone say they have a great customer experience, ask them what kind of experience(s) are they staging for their customers, because Disney never said he had a ‘Great Customer Experience’ only great experiences. 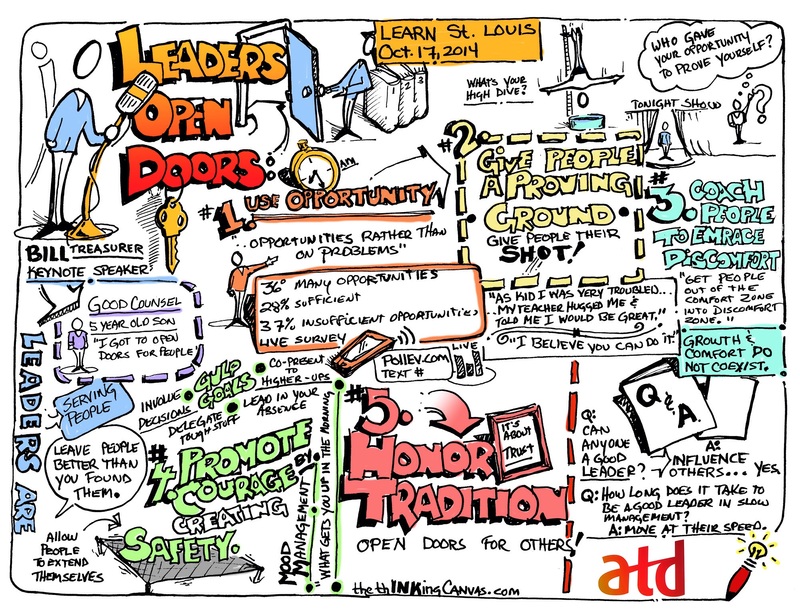 The local ATD (Association of Talent Development) held its annual conference in O’Fallon, IL in October of 2014. 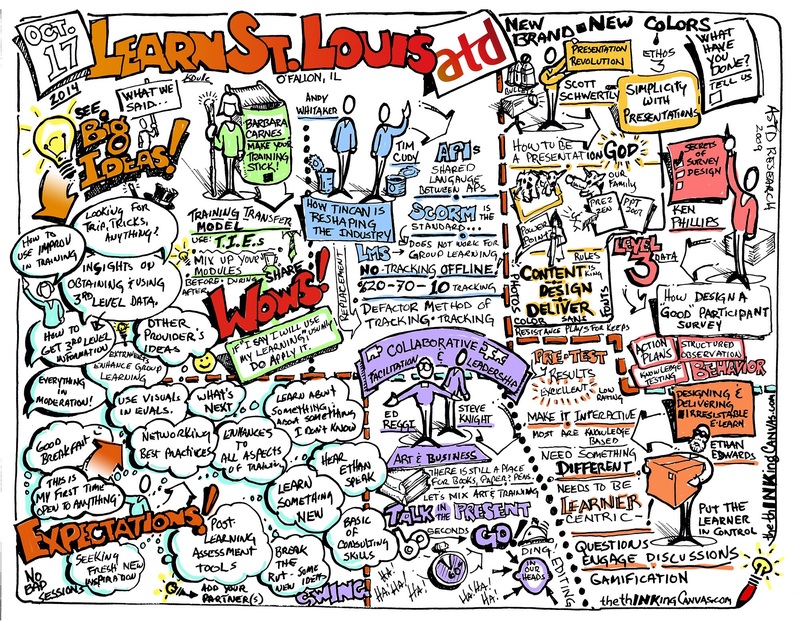 Here are some of the Graphicnotes taken as visual journalism.